The Coliseum and Roman Forum are perhaps the best testimony to the greatness and magnificence of the Roman Empire. With regard to the beauty and magnificence of the Roman Forum, just think that in the first century AD Rome is now a city of over a million inhabitants, and each emperor develops the complex of the Forum and the actual needs of citizens, both to affirm the greatness of their own and the family to which they belong. The Imperial Fora consist of a series of monumental built over a century and a half (between 46 BC and 113 AD) in the heart of the city of Rome by the emperors. 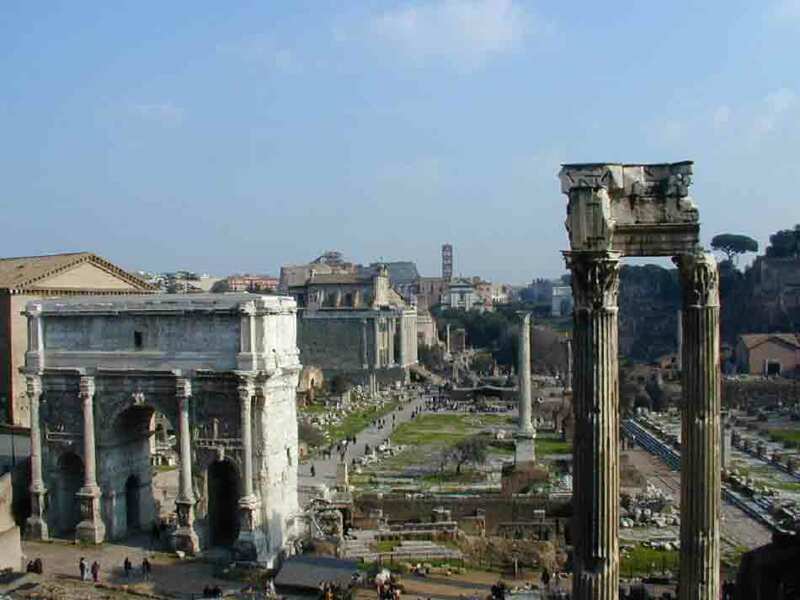 They do is instead part of the Roman Forum, which is the old square republican, whose first accommodation dates back to the director (sixth century BC), and had been for centuries the political, religious and economic center of the city, but that did not never a unitary character. Under Caesar and Augustus, the construction of the Basilica Julia and the reconstruction of the Basilica Emilia, that marked the long sides of the square, however, gave the Forum a regular basis. Julius Caesar decided to build a large square in his name, which was inaugurated in 46 BC, probably still incomplete, and then was finished by Augustus. Unlike the Roman Forum was a joint project: a square with arcades along the sides and in the center of the bottom side the temple dedicated to Venus Genetrix, from where Julius Caesar claimed to descend through Iulus, the progenitor of the gens Iulia, son of Aeneas, in turn son of the goddess. Caesar paid from his own pocket the land on which the new monument was to be built. 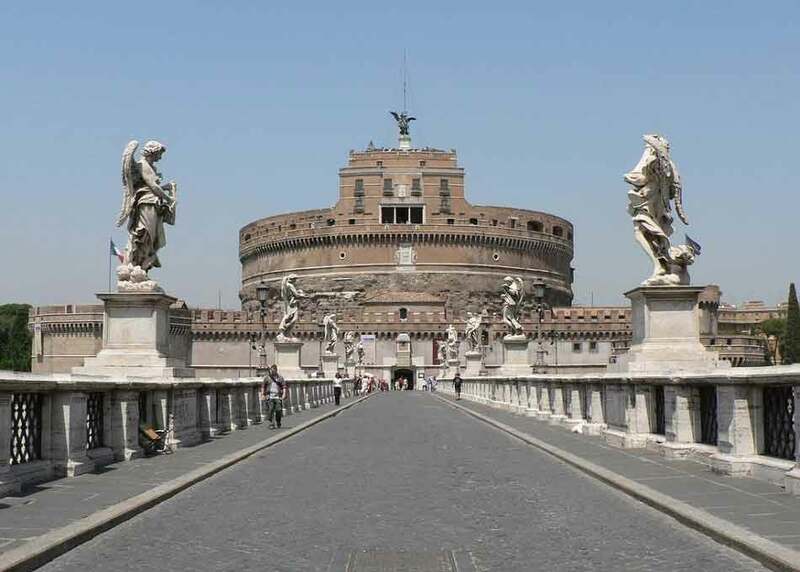 Also, having been in charge of the reconstruction of the Curia, seat of the Senate, after its destruction in a fire, made ​​it change the traditional and ritual orientation to the cardinal points, so that instead would fit that of the new Forum. 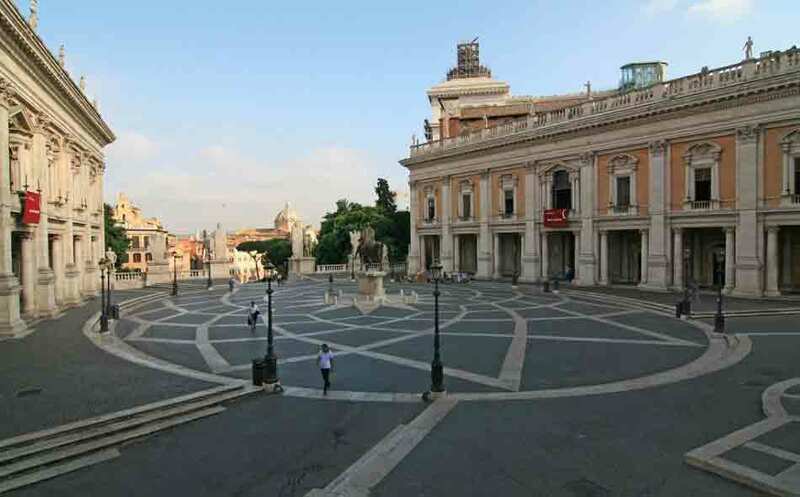 The new square resumed the pattern of the arcades built around the temples that the most important and influential politicians of the last century of the Republic had gone by building in the area of the Circus Flaminius, and had the same propaganda purposes and personal search for consensus. The proximity to the old political center however it increased the effect. Octavian had vowed a temple to Mars Ultor (ie "Avenger") on the occasion of the battle of Philippi 42 BC, in which he himself and Mark Antony had defeated the murderers of Caesar and then avenged his death. 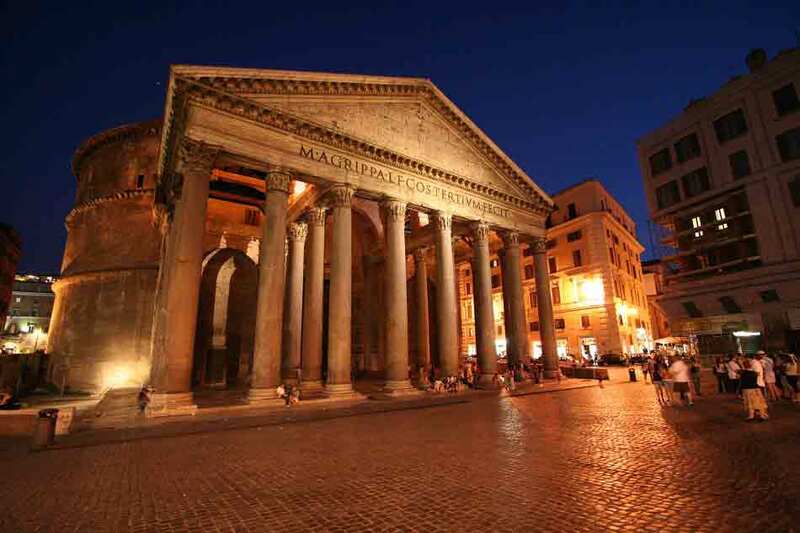 The temple was actually opened only after 40 years, in 2 BC, added a second monumental square: the Forum of Augustus. Compared to the Forum of Caesar the new complex is disposed orthogonally and the Temple of Mars was leaning to a very high wall, which is still preserved, which divided the monument from the popular district of Subura. The porches that stood on the long sides, opened behind in large exedra (semicircular spaces covered), intended to accommodate the activities of the courts. They were also adorned with statues of real and mythological history of Rome and the members of the Julian family, with inscriptions of listing their companies, and central niches groups of Aeneas and the statue of Romulus. Also in this case the construction of the complex was linked to the propaganda of the new regime and all its decoration celebrates the new golden age that you wanted inaugurated with the rule of Augustus. Temple of Peace 75 A.D. 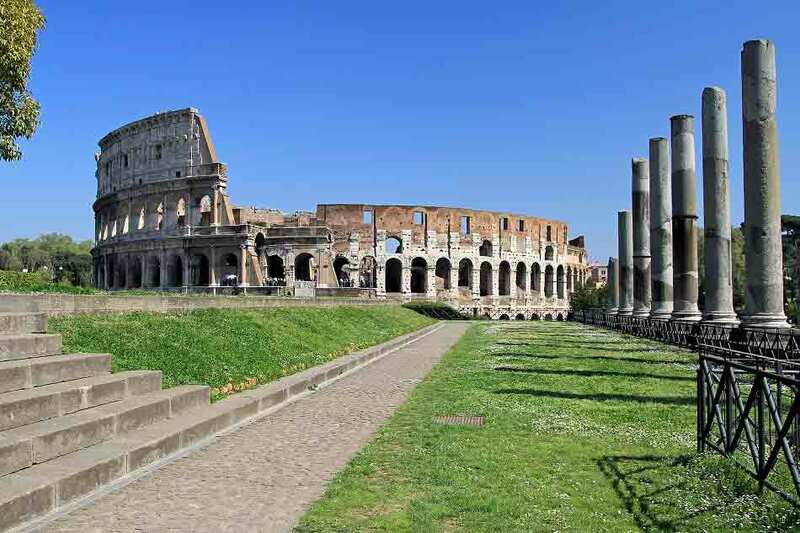 Under the emperor Vespasian was built another large square, separated from the Forum of Augustus and that of Caesar from the street dell'Argileto, which connected the Roman Forum with the slums, and more towards the Velia (in the direction of Colosseum). This complex was not originally considered as one of the Imperial Fora, if not in the Late Period, when it is referred to as the "Temple of Peace", and is in fact formerly known as the Temple of Peace. Even the shape was different: it was a large square surrounded by arcades, with the temple placed in the portico of the bottom side. The central area also was not paved like a square, but arranged garden, with water basins and pedestals for statues, which made it a real open-air museum. The monument was built as a celebration following the conquest of Jerusalem during the reign of Vespasian. Following a fire, the complex was rebuilt at least in part in the era of Septimius Severus (early third century AD): in particular this time dates the Severan Forma Urbis, the marble plan of Rome antique engraved on marble slabs that was cover the wall of one of the rooms come partially up to us. Forum of Nerva or Transient hole 98 A.D.
Domitian decided to unify the previous complex and irregular area remained free of the Temple of Peace and the Forum of Caesar and Augustus, he built another monumental square that put them all in communication with each other. The space required, partly occupied by the protrusion of one of the exedra of the Forum of Augustus and which had to be preserved in the function that switches off the dell'Argileto, forced him to reduce the lateral porticos to a simple decoration of the walls. The temple, dedicated to the goddess Minerva (her protector as it was protector of the demigod Heracles) leaned against the outside of the exedra of the Forum of Augustus, while the remaining space was used for a large monumental entrance (Portico of the apse). The death of Domitian in a conspiracy meant that the new complex, which is almost finished, was inaugurated by his successor Nerva and that these take the name of the Forum of Nerva. It is however also known as Transitory Forum, due to the function of passage that had retained substituting all'Argileto. Forum of Trajan 112-113 A.D. The projects of Domitian were perhaps been even more ambitious and perhaps already under his reign had begun excavation work of the saddle mountain that connected the Capitol with the Quirinal and closed the valley of the holes toward the Campus Martius, in the direction of the Piazza Venezia, limiting the space available for further monumental complexes. The project was resumed and completed by Trajan with the construction of a new complex in his name, made with the spoils of his campaigns of conquest of Dacia and whose decoration celebrating his military victories. Even just the preparatory work were impressive: the excavation of the saddle range, need to find room for the new complex, involved the rebuilding of the temple of Venus Genetrix and the addition of the so-called Basilica Argentaria in the Forum of Caesar, while the cut made on the slopes the Quirinal was arranged with the construction of the brick building of the Markets of Trajan. The square was closed at the bottom by the forensic Basilica Ulpia, behind which rose the Column of Trajan. As in the Forum of Augustus the arcades opened on the bottom with the large exedra. On the opposite side a monumental facade of the Basilica was the background to the colossal equestrian statue of the emperor. Way of the Imperial Fora connects the Colosseum with the Vittoriano, bordering the archaeological area of the Roman Forum. It is easily accessible by Metro from the Colosseum. 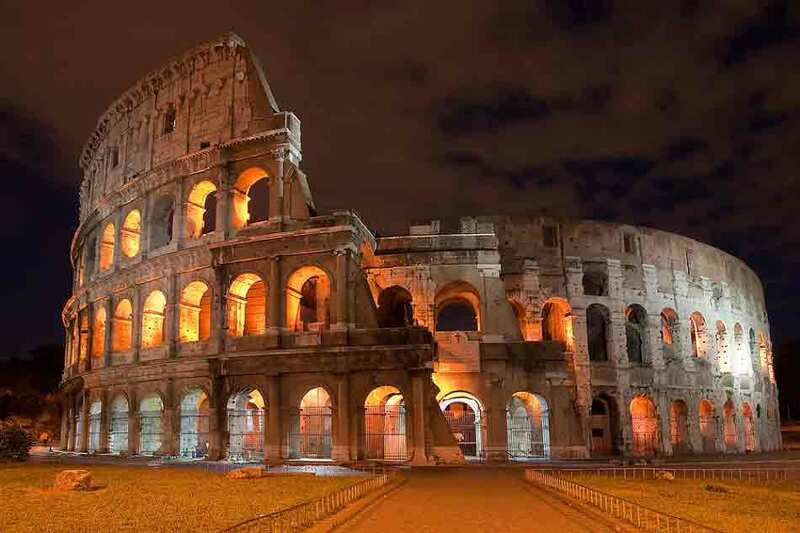 Along the way you can admire monuments such as the Colosseum, Trajan's Market, the Roman Forum, the Victorian etc.. This long straight road was built during the Fascist period, to facilitate traffic of the capital city and to get a triumphal way in a setting unique in the archaeological world. The construction work began in 1924 and ended in 1932. Not everyone, however, agree with its implementation. To build it have been demolished many churches and homes built on the site of the medieval period. In particular, the neighborhood "Alexandria", built at the end of the sixteenth century and completely destroyed to make way for the new road, which was opened by the Benito Mussolini April 9, 1932 with the name "Via Empire". The street has a strong symbolic reminder that still preserves. In a straight line connects the Colosseum, the symbol of the Roman Empire, with the Victorian, modern symbol of national patriotism. With the fall of Fascism the street was renamed with the current name "Via dei Fori Imperiali". Today it is used for the annual parade of the armed forces on June 2. The eventual elimination of the road, which cuts the archaeological areas of the Imperial Fora breaking up the original unit, has been regularly discussed since the eighties. The reasons archaeological contrasts with the current needs of urban traffic and the spectacle of its path from the point of view of tourist itinerary. New excavations have been made since the nineties in several areas previously left in the garden to the side of the road, by the Superintendence of Cultural Heritage of the city of Rome and the State Superintendent of Cultural Heritage of Rome, and archaeological investigations have also been conducted in the basement of the adjacent buildings. In August of 2013, the street was closed to traffic by the new mayor of Rome. For the future it is planned to launch new archaeological investigations. Also, are under consideration, both the hypothesis of total pedestrianization (also closing the access to public transport), and the complete elimination of the road (leaving only some sections pedestrians). Located between the slopes of the Quirinal and the beautiful Rione Monti, the monumental complex of the Markets of Trajan, was "rediscovered" in the years 1926-1934, but in fact it has never been shown that this space absolve the function of the market. Divided into six levels, with separate buildings from flagstone streets - among them, the way Biberatica - was actually a multi-purpose center in connection with the homonymous Forum. An absolute novelty, the first example of a museum of ancient architecture, this is a unique space in the world, and is linked conceptually and topographically the entire urban system dei Imperial Fora: of Caesar (46 BC), Augustus (2 BC), of Nerva (97 d.C.) and Trajan (112 and 113d.C). Is sited in the Great Hall and the Central Body which includes the Great Chamber with the section of the Forum of Trajan. The exhibition starts from the Great Hall, with the introduction to the Forum and the representation of each through the most important discoveries. Are hosted in fact 172 original fragments of marble, from the Roman Forum, casts 15 and 12 shifts. From 1985 to date have been inventoried and documented about 40,000 fragments. The measures implemented in the deposits of the forums in the course of twenty years, they have seen in fact a complex task of inventorying and documentation, which continues today and will ensure that over time the constant updating of the permanent collection of the Museum of the Imperial Forums. The cleaning of the ceiling of the Great Hall monumental, almost "canceled" under a layer of smog, has brought to light the conglomerate Roman Empire, and noted the lesions and restorations that have taken place over time. The complex Trajan, is located in a strategic point of the modern city of a cultural ideal that connects one side to the great museum center of the Capitol, in the Via Nazionale, where the Palace of Exhibitions, the National Archaeological Museum, from another to the archaeological center - the Colosseum, the Roman Forum and Palatine Hill, and the Roman Forum. Detail of no small importance, the choice museological appears good, especially for the reversibility of the installation that allow to integrate with any other fragments that may emerge from the excavations of the holes still in progress. The new interventions (the closing of the Great Hall), the external routes of iron and wooden walkways, lighting, fit discreetly in the background, in a choice that integrates innovation and tradition, almost evocative of the museum design choices of Carlo Scarpa, the skilled architect who reinvented the Second World War with understated simplicity, the Castelvecchio Museum in Verona, a perfectly in-line between ancient and modern. The relationship between space and time, has been given to the views to the outside. At different points of the exhibition, and were placed facing windows, a sort of invitation to enjoy the beautiful outdoor space that runs from the markets to the city.